The average human walks 70,000 miles in a lifetime! The feet work so hard for us, but are often the most forgotten parts of our body. In particular, diabetic feet need extra special care. 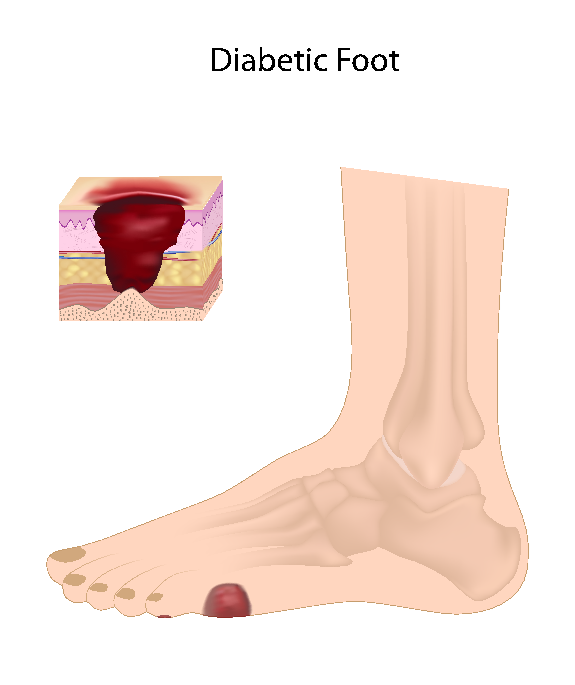 Chronic wounds and infections of the skin, particularly of the feet, are more common in people with diabetes than in non diabetics. This patient education sheet will introduce you to the basic principles of healthy diabetic foot care. 35,000 major amputations are performed each year because of diabetes. Perhaps we can help prevent serious foot problems by understanding a little more about diabetic feet. Human tissue cells require internal glucose and protein building blocks for proper energy and functioning. The hormone, Insulin, works by helping glucose get inside of human tissue cells. In addition, insulin is tissue building. These basic glucose transporting and tissue building insulin processes are deficient in people with diabetes mellitus. Human tissue cells cannot function properly without insulin. Arterial ulcers result from lack of oxygen to the skin because of the chronic closing off of larger blood vessels seen in diabetes mellitus. Neurotrophic ulcers result from lack of oxygen and nutrition to the peripheral nerves because of the chronic closing off of smaller blood vessels that supply the nerves in diabetes mellitus. In arterial ulcers the skin "suffocates." In neurotrophic ulcers, the nerves "suffocate." Think about it... What happens when the skin "suffocates?" Exactly! The skin does not get oxygen, thus, it dies and forms an ulcer. What happens when the nerves "suffocate?" Exactly! The nerves do not get oxygen, thus, nerves die, the skin loses its sensation, and ulcers form when harmful trauma or pressure cannot be felt. I have seen patients with traumatic neurotrophic ulcers due to objects left in shoes such as such as shoe horns and jewelry. The most common types of neurotrophic ulcers occur at extra heavy pressure points on the heels and balls of the feet. Both arterial and neurotrophic processes can lead to gangrene. If foot bones and muscles are involved, the feet are slowly deformed with crooked bones and cocked up toes. This condition is called Charcot's Foot. - Avoid temperature extremes on the feet. Always test the water before dipping your feet in. Beware of hot sidewalks and asphalt. Never go barefoot. - Cut toenails straight across. - Do not step on the floor with bare feet. - Do not wear bedroom slippers when you should wear shoes. Slippers do not give proper support. - Do not wear garters or sit with legs crossed. Either will decrease circulation to the feet, and the circulation may already be less than normal because of the effect diabetes may have on your blood vessels. - Do not wear mended stockings or socks. - Do not wear sandals or thongs. - Do not wear shoes without socks. Wear thick cotton socks & loose shoes. - If toenails are brittle and dry, apply lotion generously under and about the nails for a few nights after soaking. Cut nails carefully straight across. Do not cut on the sides of the nail or the cuticle. If you go to a podiatrist, foot specialist, or chiropodist, be sure to tell this doctor that you have diabetes. - If your feet are cold at night, wear socks. Do not use heating pads or hot water bottles. - If your toes overlap or are pushed close together, separate them with lamb's wool. - If your vision is impaired, seek help from a family member. - Inspect your feet daily for scratches or tears. Use a mirror if necessary. - Inspect your shoes daily for foreign objects. - Prevent calluses under the balls of the feet by exercise: curl and stretch the toes 20 times a day; finish each step that you walk on the toes (not on the balls) of the feet. - Remove shoes for short periods when you can. - Shoes should be comfortable at the time of purchase. Don't plan to stretch them out. Buy extra wide, extra long Hush Puppy type shoes. - Use cotton bed socks if you need extra warmth for your feet when you are in bed to sleep, but do not use hot-water bottles, bags, or electric heaters. Don't burn the feet! Electric blankets are satisfactory. - Wash feet daily with soap and warm (not hot) water. Dry thoroughly and gently, especially between the toes. Powder the feet once a week with talcum. Use antifungal powders regularly to prevent infection. - Wear shoes of soft leather which fit but are not tight. Break in new shoes gradually 1 hour a day. - Wear thin socks of cotton (not wool) to prevent moisture, which stimulates germs that cause athlete's foot or other skin infections. Wear clean socks that you change at least once a day. Do not wear loose socks with raised seams. - When the feet are thoroughly dry, rub cream into the skin of the feet to keep the skin soft and free from scales and dryness. Do not rub so vigorously that the feet become tender. Do not cut corns or calluses or try to remove them with irritating preparations or other callus medications.